Sometimes you have to look below the surface of the numbers to get the whole story. Such is the case with Springboro's January home sales numbers. Sales were HALF of December's. That's low even when you consider January is traditionally slow for home sale. That COULD be scary if you just focused on that number. But take a little closer look at the number of homes under contract (52 total) and you can see January was just a temporary blip. Stay with us for the full Springboro report and our advice for potential Springboro home sellers and buyers. And if you want to search Springboro homes for sale, we've got search for Springboro homes for sale links at the bottom of the report. Want to know How Much Is My Springboro Home Worth? Just click the link, fill out the form and we'll get back to you shortly! This report covers the Springboro Community School district single family homes (so portions of surrounding townships will be included e.g. Clearcreek & Turtlecreek). This report will only cover single family homes and not include condominium data. Data is derived from the Dayton MLS only, so homes sold without Dayton MLS entry will NOT be included in this review. The Springboro area is popular, especially with residents seeking to commute into Dayton (easy access with I75 and SR741), and even works well for those not minding a bit longer commute south to the Cincinnati area. Springboro is a good choice for couples where one works in Dayton and the other in Cincinnati. Springboro Community Schools are among the state's best public schools per the Ohio Department of Education ratings. Additionally Springboro was selected #42 in U.S. in 2011 by Money magazine for Best Small Cities To Live and probably would have made the 2013 & 2015 lists, but Money magazine changed the rules to only one town per county and Mason got the nod. Keep in mind that some homes may only be listed in the Cincinnati MLS and will not be included in this report. We STRONGLY recommend any Springboro resident selling their home hire a REALTOR(R) with access to BOTH Cincinnati and Dayton MLS. Next is the Springboro median price summary chart. As we mentioned at the beginning, not a great number for total homes sold in January. But take a look at the significant swing in Pending and you can see the market is still VERY much alive and well. The shortage of homes for sale was a little less drastic, with a small increase in homes not under contract. 12 of those 75 are new construction homes. 75 is still pretty skimpy for selecting once you narrow down price and other needs. Sales prices were still good. Distressed properties are still rare, accounting for none of the homes sold and one of the homes not under contract. Don't expect huge discounts from asking price. 97.5% sold to list price for is the highest we've seen in Warren County for quite some time. Bottom line: Springboro CONTINUES to be one of your best choices for buying a home in the Cincinnati/Dayton corridor but act fast for the best of the best homes. So what does this mean to you as a Springboro single family home owner? No change for sellers. The time to sell is still close to 3 months, a bit slower than some other Warren County communities. No change to the need to be priced write and have solid marketing so the maximum buyer pool has visibility to your home. 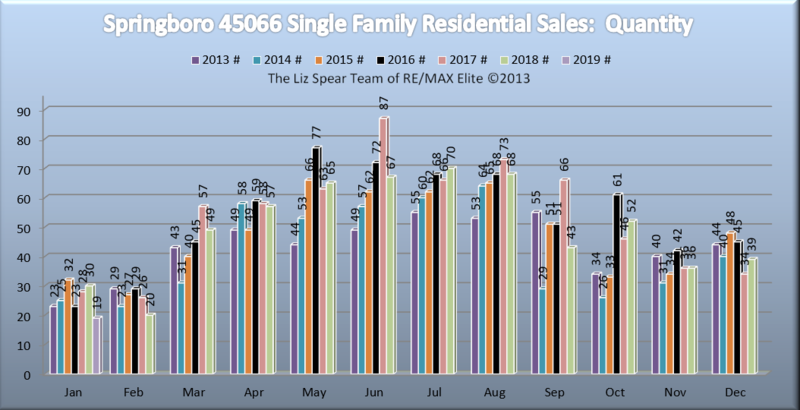 Buyers are out there and Springboro is still high demand (despite the slowdown), with great market stability and distressed properties having almost no impact. Need a real estate team to help put it all together? Just give us a call at 513-520-5305. If you're a luxury home seller keep in mind you're competing against custom home new construction in communities like Country Brook and Silver Lake. Combine that with fewer buyers able to afford luxury homes and you realize the market slice is MUCH smaller for you. For an evaluation of your home's marketability, please contact us at 513-520-5305. And of course your personal circumstances will have impact of the right decision. We'll give you our best advice, whether to start now, or wait. So what does this mean to you as a potential Springboro home buyer? Springboro is a competitive market for the best homes and the number of homes available is still minimal. Like a Springboro home for sale? Be prepared to pay for the great condition homes in the best developments. And if it's an in demand neighborhood at an affordable price you'd best act FAST or expect to lose your chance of buying that home to a buyer who was quicker to make a decision. Springboro offers a lot of prime factors to make it home: great schools, great location, great community. There are quite a few newer homes for sale in communities such as Settlers Walk, and some older subdivisions provide the lower end of the shopping price point. New construction is also available in some communities. Want to search Springboro Homes For Sale? Use these Cincinnati MLS links for a partial snapshot. For a COMPLETE overview of both Cincinnati and Dayton MLS homes, contact us and we'll provide a full list for your convenience. When you're interested in buying a Springboro home, please contact us at 513-520-5305 or email Liz@Lizspear.com with your needs and we'll help you find the right Springboro community for you! Why not take advantage of the extremely low interest rates and get your Springboro home before prices climb higher? How Can We Help You? Just Let Us Know! Ask An Ambassador: Do You Have A Blogging Formula? Find OH real estate agents and Mason real estate on ActiveRain.